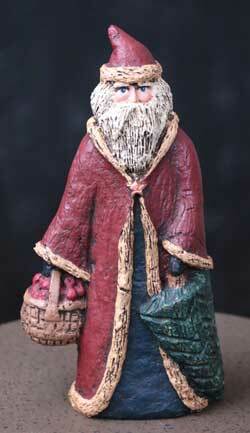 Santa with Apple Basket, by Folk Heart. Handmade entirely from start to finish by American artist Randy Thomas. This is for the Santa with Apple Basket. He wears a red coat, holds an apple basket in one hand, and a tree in the other. Stands 8.5 inches tall. Sculpted of paper mache, hand-painted, signed by the artist. True American folk art! 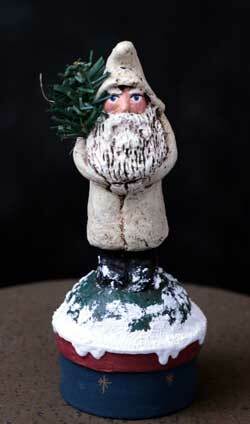 Santa with Bottlebrush Tree, by Folk Heart. Handmade entirely from start to finish by American artist Randy Thomas. 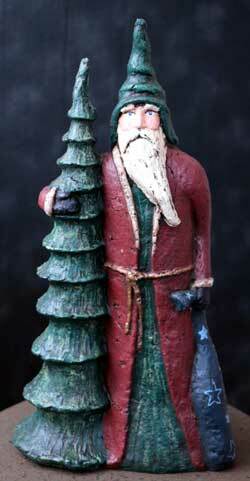 This santa wears a red coat and holds a bottlebrush tree. He is a limited edition - although techinally they all are, as they are not mass produced, but only 100 of this one were made. You'd receive #14 or #15. Stands 9 inches tall. Sculpted of paper mache, hand-painted, signed by the artist. True American folk art! Santa with Real Switches, by Folk Heart. Handmade entirely from start to finish by American artist Randy Thomas. This santa wears a red coat, green pants, and holds a bundle of real twig switches. He is a limited edition - although techinally they all are, as they are not mass produced, but only 100 total of this one were made. You'd receive #31. Stands 12 inches tall. Sculpted of paper mache, hand-painted, signed by the artist. True American folk art! Santa with Tall Tree & Sack, by Folk Heart. Handmade entirely from start to finish by American artist Randy Thomas. This santa wears a red coat and green hood - he holds a blue sack in one hand, and hugs a tall evergreen tree with the other. He is a limited edition - although techinally they all are, as they are not mass produced, but only 100 total of this one were made. You'd receive #28. Stands 15 inches tall. Sculpted of paper mache, hand-painted, signed by the artist. True American folk art! 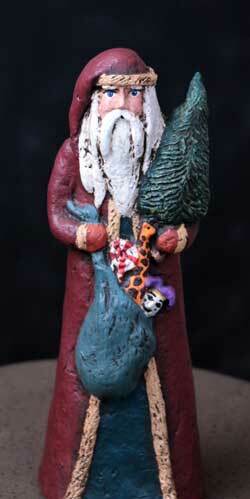 Santa with Toy Sack & Tree, by Folk Heart. Handmade entirely from start to finish by American artist Randy Thomas. This Santa wears a red coat, holds a tree over one shoulder, and a blue bag full of toys in the other. Stands 8.5 inches tall. Sculpted of paper mache, hand-painted, signed by the artist. True American folk art! Santa with White Coat, by Folk Heart. Handmade entirely from start to finish by American artist Randy Thomas. This is for the Santa with White Coat. Holds a walking stick and red shoulder bag. Stands 8.5 inches tall. Sculpted of paper mache, hand-painted, signed by the artist. True American folk art! Tall Santa with Switches and Bag, by Folk Heart. Handmade entirely from start to finish by American artist Randy Thomas. 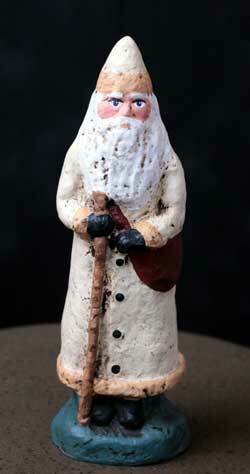 This Santa is taller, standing at 12.5 inches. He wears a red coat, holds a bundle of switches in one hand, and has a bag over his other shoulder. 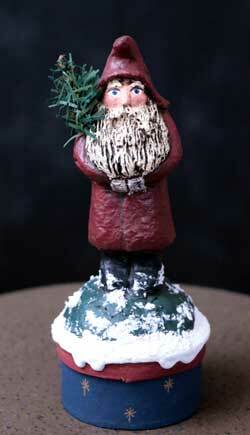 Sculpted of paper mache, hand-painted, signed by the artist. True American folk art!